For anyone truly interested in wallpaper history, you should know about Adlephi Paper Hangers, the premiere wallpaper house dedicated to historically accurate patterns and production. 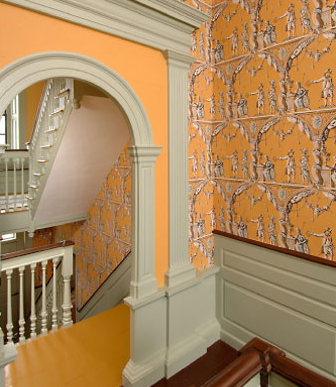 Emphasizing eighteenth and nineteenth century papers, their collection includes wallpapers from institutions such as the Colonial Williamsburg Foundation and the Smithsonian Institute. Adelphi also researches and designs custom jobs for any individuals who have anydocuments or wallpaper scraps of an old design. Their wallpaper are made with the old fashioned wood block method. In fact, Adelphi operates the only bloc printing facility dedicated to producing vintage patterns in the United States! Very inspiring.